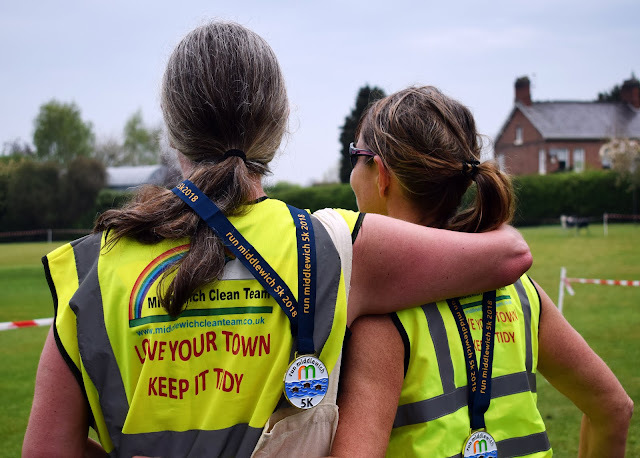 The first ever Middlewich 5K (3 miles) run took place this morning and two of our members took part, in support of Middlewich Clean Team of course. Maxine and Hilary found themselves some sponsors and then all they had to do was turn up and run! 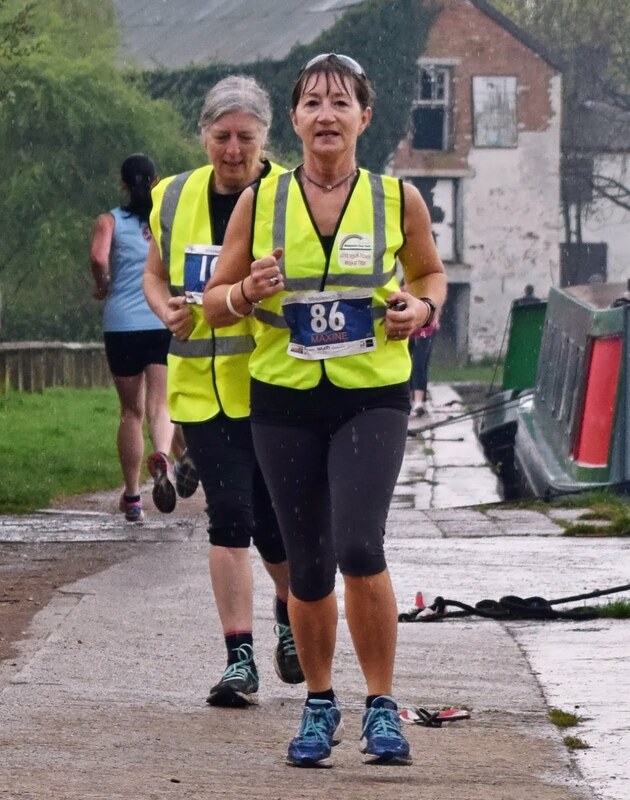 The unfavourable weather forecast proved true with a wet start; the rain poured down but as Hilary said, “It was better than trying to run in the blistering heat we had only a few days ago”. 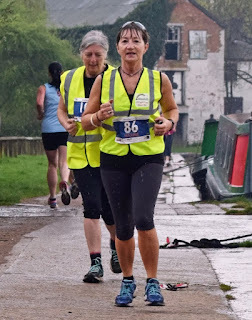 The course ran from the Big Lock and along the canal in the Sandbach direction until just past the dry dock. There the path loops back on itself providing the turning point back to the Big Lock. After the Big Lock the runners headed for Middlewich Cricket Club via Croxton Park and Croxton Lane, then at the cricket club the run finished with two circuits of the grounds. 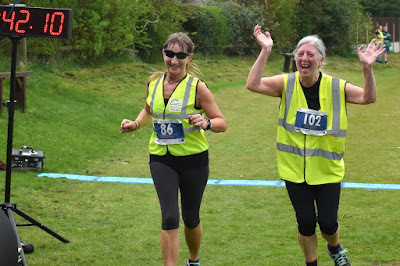 Maxine and Hilary were not the first to finish but they were not the last either, finishing 16th & 17th in their class with a matched time of 42 minutes and 10 seconds. 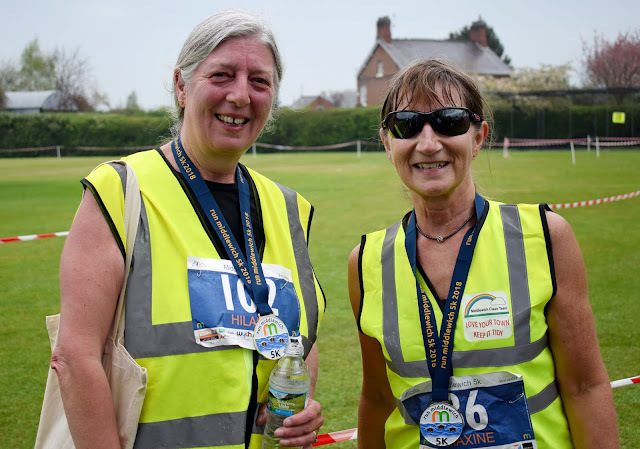 All runners completing the course were rewarded with a medal which Maxine and Hilary were rightfully pleased to show off. The run itself was sponsored by Revelation Properties and there had also been Family Run prior to that which was sponsored by Harvester and Fizzy Eds. Maxine and Hilary were impressed with how well organised it all seemed to be and of course we must also mention other Middlewich Clean Members that were on duty to clear up any litter. 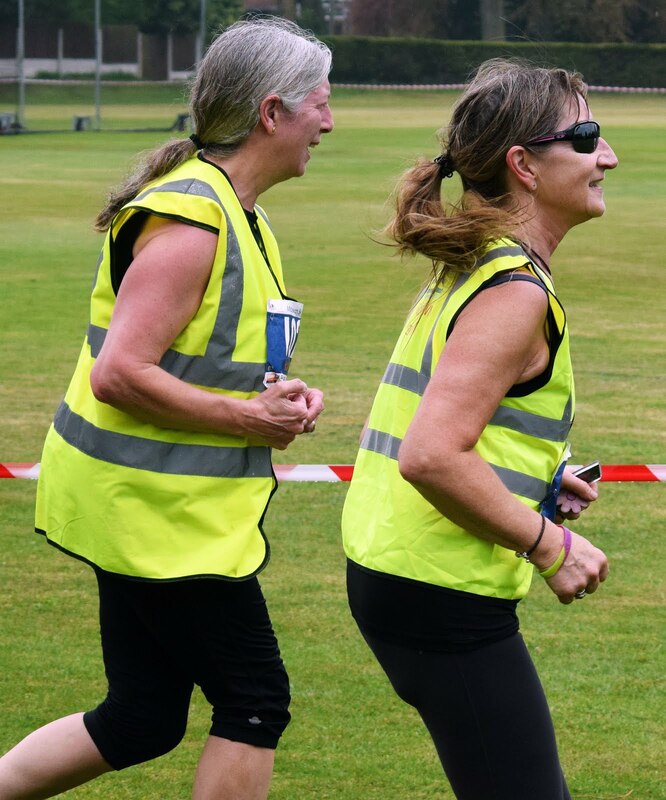 If you would like to litter pick with us along the canal, we are meeting at Brooks Lane Bridge at 9:45am 😎 once all the runners have completed that section of the route we will litter pick to the Cricket Club. The family fun run starts at 9am at Middlewich Cricket Club. The main 5k event starts at The Big Lock pub at 10am. The 5k route starts at the Big Lock Pub, the route loops around the famous Three Locks and back past the Big Lock, giving spectators 2 chances to see runners. The route continues along the canal to Croxton Park. 1 loop of Croxton Park and out onto Croxton Lane. From there runners will enter Middlewich Cricket Club and run 1 loop of the pitch before finishing and collecting a Medal and Goodie Bag. What a brilliant team we are!